Read on for my perspective on these four ideas. To address the first one in very personal terms, cycling is easier than walking for me. It's not something I've just taken up--I've been a confident rider for over three decades. I can get places at least twice as fast, with the wind cooling me down, rather than dragging Sprout along the hot sidewalks in my neighbourhood. By the time I got to my third trimester, walking had become so arduous & exhausting that I avoid going more than a few blocks. Cycling, on the other hand, is still fun. I've got a hybrid bike with cruiser bars & a really low granny gear that I use A LOT these days. I sit upright, have lots of room for my belly & the gearing allows me to use the extremely efficient mechanics of the machine to get uphill with less effort. Cycling--at least the kind of relaxed transportation city cycling that I do--is actually not great exercise. I rarely get my heart rate up much & don't burn a whole lot of calories while doing it because it's so damn efficient. Pregnant women are advised to do moderate, low-impact exercise & cycling certainly fits the bill. Continuing to do the same kind of exercise during pregnancy, then adjusting as needed is fine. If you're a runner, you don't need to stop as soon as you get a positive on that test. Same goes with cycling--I rode before I got pregnant, so continuing was no big deal. I just went a little slower & geared down more than I had. I got myself a wider seat when my hips started to really loosen up to better support my sitz bones, but that's about it. In terms of risk, it's true that I am more likely to be injured on a bike than driving in a car. However, I rarely drive cars because we don't need to own one in the city. My main forms of transportation are walking & cycling. I live in a neighbourhood criss-crossed by bike paths & quiet side streets. Last time I checked (sorry, I can't find the source to reference here) cycling & walking were about equally dangerous. EDIT: riding a bike is more than twice as safe as walking in terms of risk of death by distance travelled, Source Most people wouldn't consider walking across a city street to be something a pregnant woman should avoid, so why the attitude that baby bumps don't belong on bikes? I should mention that I didn't bike at all during my pregnancy with Sprout. My first pregnancy, where I lost my little boy Arrow at about 18 weeks, I biked to work & back 10km a day four to five days a week. Though the miscarriage had nothing to do with cycling, I decided to stay off my bike to have one less thing to worry about the next time around with Sprout. "But what if you fall?!" This time, when I thought about nine months off my bike, I cringed. 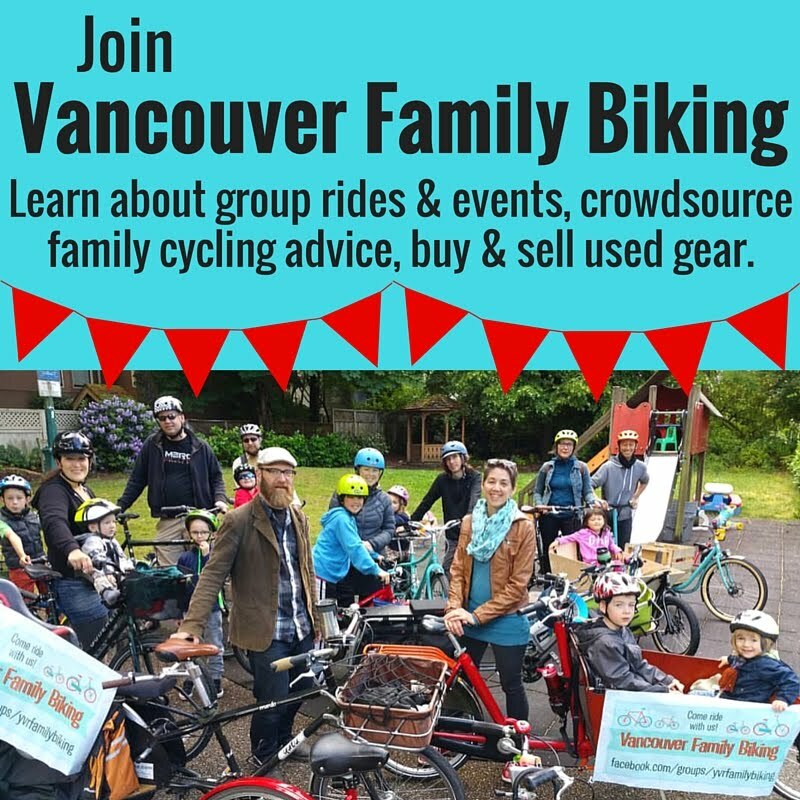 I realized that I'd been riding with Sprout on my bike or towing him in a trailer behind it for two years, so why would I treat his little sister differently? Ensconced behind layers of skin, fat, muscle & amniotic fluid, nestled in behind my ribs & pelvis, she's actually quite well protected & unlikely to just fall out if I had a minor spill. Think about it: if fetuses were that sensitive, & women that fragile, how in the world would our species have survived? In the Netherlands & Denmark, pregnant women are much more likely to ride & it's seen as normal. How else would they get around? I bumped into a Dutch acquaintance of mine at the pool not long ago. She was unloading her two preschoolers from their bakfiets & I realized she was quite pregnant. Thinking that it was great she was still cycling that heavy bike around, I asked her when she was due. "Saturday." she replied, nonchalantly. Compared to North America, risk of being injured while cycling in the Netherlands or Denmark is much lower, as they are decades ahead of us in terms of infrastructure & education. But still I think it's worth looking at the attitude toward cycling as just a normal way to get around, not an extreme sport. 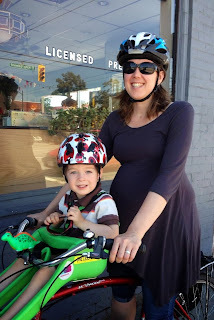 This Cycle Chic post has some great shots of pregnant women on bikes. So here I am, 36 weeks pregnant & planning to bike to the pool for a playdate on Monday. I had initially thought that I might not still be riding this far along, but it's still just the easiest & most comfortable way for me to get around. Last week I walked a couple of kilometres & was sore for days. However, riding the same distance doesn't bother me at all. I think at this point I'll probably be riding up until the day she's born. Mamas out there: did you ride while pregnant? If not, why not? How far along where you when you stopped? Hey Eva, thanks for the encouragement! Staying active during pregnancy is definitely part of the reason I ride. It was definitely easier to exercise the last time around though.